Along came Sunday. We had grand plans to go to a Brunch Party, however none of us had any desire to brunch after the party on Saturday night. So instead we finally managed to get in some site seeing. Given Miss Mat & I had visited the concrete jungle before, we weren’t as bothered as Miss Mel, however we bit the bullet and headed to the Empire State. Our concierge had convinced us that the queues would be super long so we bought the queue jump tickets, only to arrive and find not a single person in site. Turns out queue jump is best used for when you leave the Empire State as its approaching sun set, so it came in slightly handy. Post the Empire State we headed back to the hotel to pack up and take a well deserved nap. Site seeing was always on the agenda for Sunday evening, the plan was to walk around New York post Brunch, but as Brunch had been cancelled, we decided instead to walk around Time Square post dinner. Ippudo was on a list that was sent to me by a friends boyfriend whose friend had specified that the Hirata buns were a must. So after a quick look on Google to check the resident vegetarian would be have a few options, we headed out. Our cab dropped us outside and after walking through the quirky wooden door, we entered the restaurant. Essentially three rooms of red, white and brick and a bit of wood thrown in too. We were quickly shown to our booth in the restaurant area which even for 9.30 on a Sunday, was pretty jam packed. We barely had to wait before our very very helpful waitress came over and asked if we wanted to order our drinks. At the same time, we ordered a few of the starters, which Miss Helpful advised would arrive as soon as they were ready. First up was the Edamame with spicy salt. The salt wasn’t particularly spicy, unless of course you were the poor sod to pick up the piece of edamame that was drenched in the powder. Next up was the Ippudo Salad which we chose to order with a side of Avocado. The salad consisted of thinly sliced radish, crispy lotus root, juicy tomatoes and assorted salad leaves with a shot glass of a wasabi goma shoyu dressing. Miss Mel did a wonderful job of pouring the dressing over the salad and then convinced us to follow the Malaysian tradition of “tossing for good luck” which is normally used for a special Chinese new year salad. Given that this was our last night in New York, we thought we’d give it a go anyway, so we poked our chopsticks in and gave it a good old toss! The Avocado was chopped up and faced down in a puddle of the same dressing (i think). I’d never seen an avocado served in this way, but wow did it work well. The flavours in the dressing complemented the creaminess of the avocado perfectly. Next to arrive were the Hirata Buns. This was the must order on the list I’d found the restaurant and subsequently, two New York friends also recommended them highly. We ordered the Pork Hirata Buns for Miss Mel & I and Miss Mat ordered the Veg Hirata Buns which consisted of fried eggplant & eringi mushrooms. The pork was perfectly cooked, crispy on the outside whilst soft and fleshy on the inside, not that dissimilar to the slab bacon at Jackson & Rye. The actual bun was perfectly soft and fluffy. To those who haven’t yet tried the Hirata bun, the pastry (if you can even call it that) is much the same as Chinese bao. Miss Mat was equally complementary of her veg option and quickly demolished both. The Salmon Yuba Maki arrived at the same time as the Hirata buns. This was essentially ssalmon sashimi and fresh yuba wrapped in paper thin cucumber and served with a sesame wasabi dipping sauce. Whilst this was ok, the salmon didn’t taste like it was at its freshest and the sauce was required to give it any major flavour. Described in the menu as “a more bold, modern translation of the original “Tonkotsu”(pork) broth; thin noodles topped with Ippudo’s secret “Umami Dama” miso paste, pork chashu, cabbage, sesame kikurage mushrooms, scallions, and fragrant garlic oil” – this came highly recommended by Miss Helpful so both myself and Miss Mel gave the Kamaru Modern a shot. I ordered mine with a side of chilli sauce which helped to deepen the flavours even more. Miss Mel found the meat slightly fatty, however it was so soft it just melted in your mouth. The noodles were very slightly doughy but the broth was amazingly flavourful and truly delicious. Miss Mat went for the gluten-free, vegan friendly Sho-jin ramen – also the only vegetarian main on the menu – Miss Helpful described the flavours as delicate however Miss Mat found it slightly bland, until she added some of the chilli sauce. We decided not to order dessert and instead pick something up from Time Square – which sadly didn’t happen. 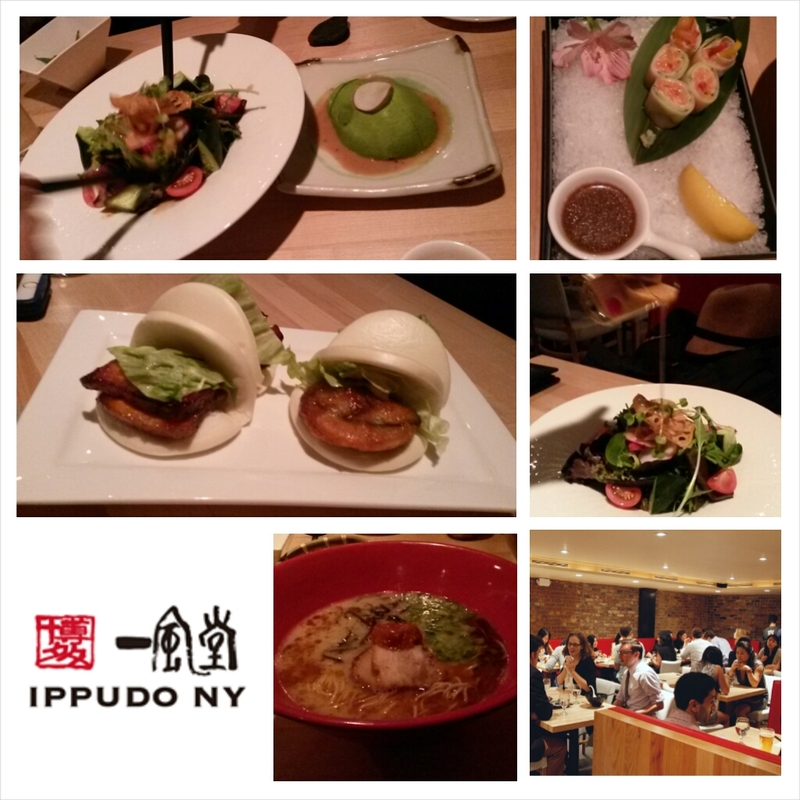 On the whole we were all pretty impressed with the offerings of Ippudo – definitely one to check out if you find yourself in New York any time soon. Here’s the best bit, since being back I found out that we’ve got Ippudo (which also turns out to have outlets all over the world) coming our way in June! Woohoo!